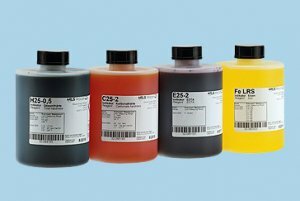 RLS Wacon offers reagents suitable for your analyzer. In addition to the reagents for our Sycon analyzers the product program also includes compatible reagents for the analysis equipment from other manufacturers. The HA reagents are designed for the determination of the residual or total hardness and are suitable for our analyzer Sycon 3000 H.
The CA reagents are designed for the determination of carbonate hardness and are suitable for our analyzer Sycon 3000 C.
The reagent FE 4 is designed for the determination of iron and is suitable for our analyzer Sycon 3000 Fe.